If you are a fan of classically-styled motorcycle gear, you probably know of Roland Sands Designs. You probably also know of the Bell Bullitt. And now, in case you didn’t know that they have a long-standing partnership, well, they do! 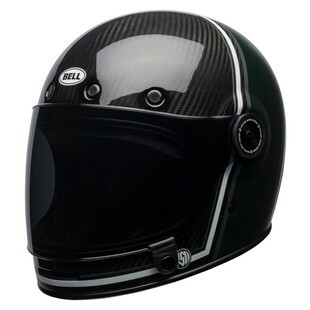 The latest addition to this lineup of Bell / RSD helmets is the Bell Bullitt Carbon RSD Range Helmet. It takes the profile and features of the super-baller (and super popular) Bell Bullitt Carbon Helmet and pairs it all up with the eye for design that is ever-present in all of Roland Sand’s gear. Additional features of the Carbon RSD Range Helmet include a multi-density EPS liner, contoured cheek pads, Magnefusion magnetic strap keeper, five-year warranty, and both DOT and ECE safety certifications. Oh yeah, and a carbon composite outer shell that not only makes this helmet lighter than its contemporaries, but also way cooler looking as well. Like any good team, Bell and RSD continually work to get better. They do not rest on previous successes, and they do not allow themselves to be complacent. The new Bullitt Carbon RSD Range is a prime example of that ethos in action.